At least nine people have died in Florida. His home damaged and his spirit crushed by Hurricane Michael, Kenny Day broke down in tears as he stood outside a Pensacola, Florida, motel and contemplated his future amid the sprawling devastation. Day's home in Panama City, 140 miles southeast of where he stood, was one of many that were damaged or completely destroyed by the Category 4 storm that made landfall on the Florida Panhandle on Wednesday with maximum sustained winds of 155 mph, killing at least 18 people in Florida, Georgia, North Carolina, and Virginia. "It's going to be rough for a while in Panama City," Day told ABC News. "I'm originally from Indiana and a couple of times I thought [that] while I've got a little money in my pocket I might as well head home to Indiana because it's going to be forever before we get back to normal." Rescue crews with search dogs continued to comb through the wreckage on Sunday, hoping to find survivors. Hundreds of people have been reported missing. At least 46 people remained unaccounted for in hard-hit Mexico Beach, where the hurricane made landfall, the city's mayor, Al Cathey, told ABC News on Sunday. Florida Gov. Rick Scott and Brock Long, administrator of the Federal Emergency Management Agency, toured the hard-hit areas of Mexico Beach, Panama City, Blountstown, and Bristol on the Panhandle Sunday. 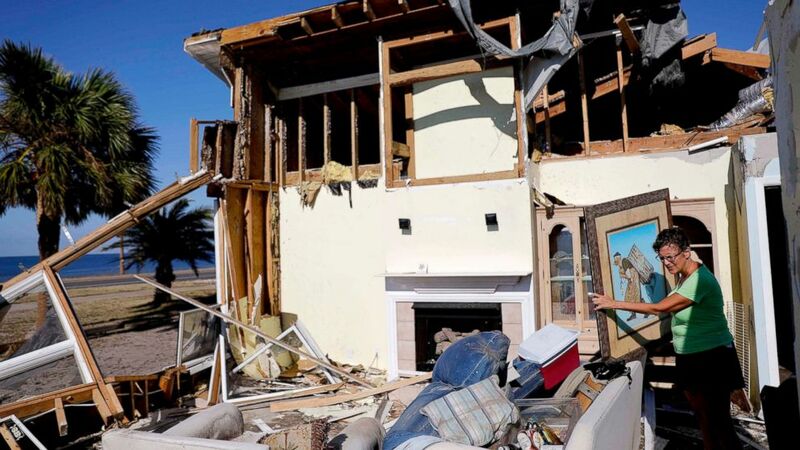 (AP) Members from South Florida Task Force search a flattened home destroyed by Hurricane Michael in Mexico Beach, Fla., Friday, Oct. 12, 2018, after Hurricane Michael went through the area on Wednesday. "We will continue working with impacted communities to make sure they have all the resources available," Scott said in a tweet on Sunday morning. Day has lived in Panama City for two decades and said riding out Michael was "the most scared I've ever been in my life." "The whole house shook. It felt like the whole house was going to come apart at some point," Day said. "Luckily it didn't. I'm amazed it didn't." Day's home suffered minor damage, and he's been staying at a motel in Pensacola, but he immediately headed out to buy supplies and has traveled back and forth to Panama City to help others whose homes were damaged worse than his. I’m on the ground with @FEMA_Brock this morning to survey damage in Mexico Beach, Panama City, Blountstown, and Bristol. We will continue working with impacted communities to make sure they have all the resources available. "How does it feel to have that help? We need it. We're gonna need it bad," he said. "Man, it's gonna be rough for a while in Panama City." Hurricane Michael's death toll climbed to 18 on Sunday. Officials expected the number of people killed by the storm to go higher as crews sifted through the wreckage of once-bustling oceanside cities, like Mexico Beach and Panama City Beach. 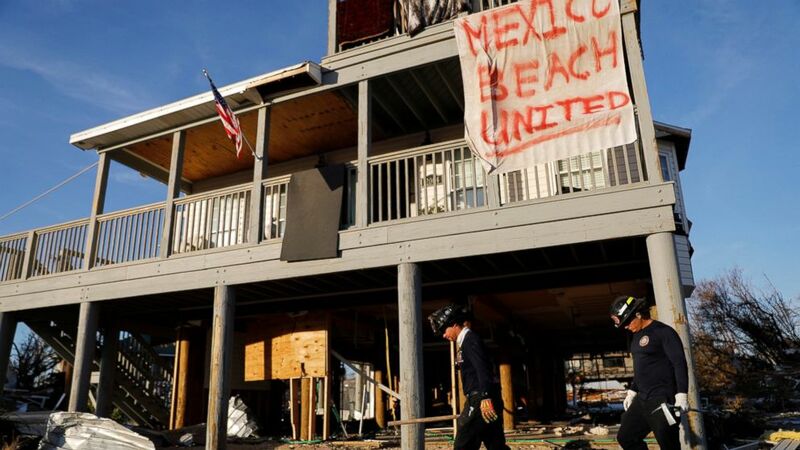 Mexico Beach was largely decimated when Michael made landfall there Wednesday. "There are individuals who are deceased. 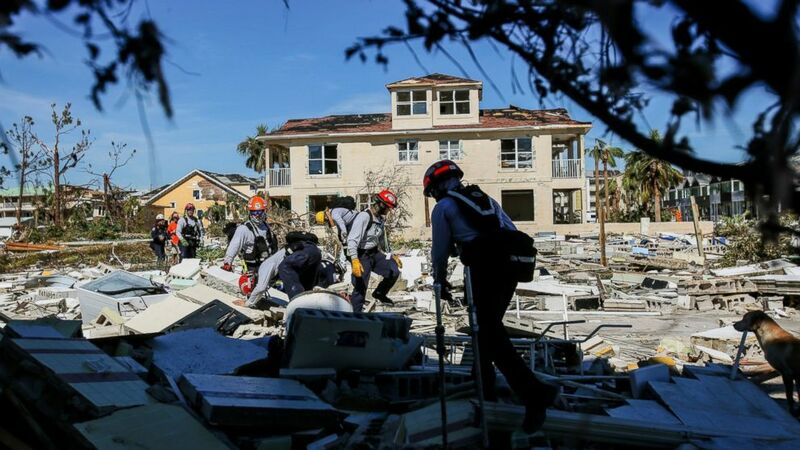 We do not have a count, but we are working to identify them," Miami Fire Chief Joseph Zahralban, leader of a search-and-rescue team in Mexico Beach, told The Associated Press. Of the 18 people killed in the storm, nine were located in Florida. Four people died in Gadsden County and three died in Jackson County, in addition to one recovered so far in Mexico Beach, located in Bay County. One fatality was reported Sunday afternoon in Gulf County. Jackson County Emergency Management Agency Director Rodney Andreasen said one of the fatalities in Jackson County occurred when a man was struck by a tree in Alford. FEMA Administrator Brock Long warned on Friday that the death toll will likely climb. "I hope we don’t see that climb dramatically, but ... we still haven’t gotten into some of the hardest-hit areas," he said. (AP) This aerial photo shows debris and destruction in Mexico Beach, Fla., Friday, Oct. 12, 2018, after Hurricane Michael went through the area on Wednesday. Ray Jadallah, from the Miami-Dade County Florida Task Force 1, has spent the last few days -- 20 hours a day -- digging through debris in Mexico Beach, where on Saturday firefighters put up an American flag on a makeshift pole in the middle in a neighborhood reduced to splinters by the monstrous storm. Jadallah said his task force is ignoring intact structures and painstakingly going door to door of collapsed buildings, first making noise to alert anyone who could be inside that they are not looters, and then sending in a cadaver dog to search for any bodies. So far, they have located just one dead body, a relative relief for Jadallah, who did the same work following Hurricane Katrina when they found "numerous victims." The destruction in Bay County has largely been from wind damage, as opposed to the flooding during Katrina. 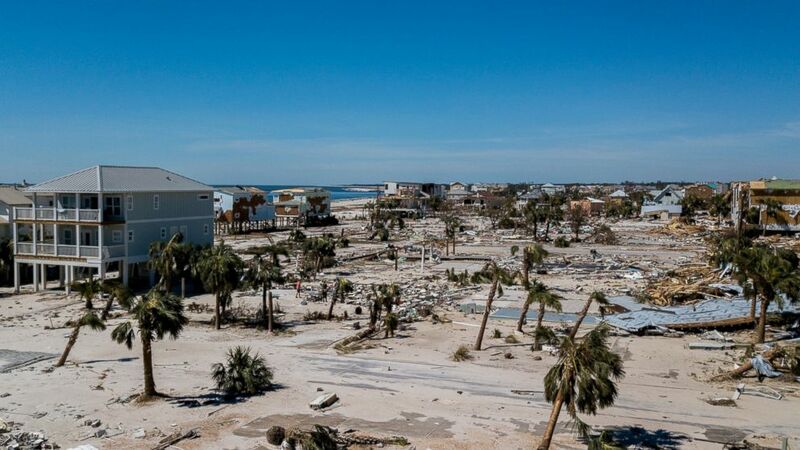 "We were just surprised by the sheer damage," Jadallah said of arriving in Mexico Beach after Hurricane Michael. "Literally overnight it went from a Category 1 or 2 to a Category 4, almost borderline 5. This type of destruction we haven't seen since I was a kid and that was Hurricane Andrew. This is pretty extensive, the damage. It's going to take some time for them to get back on their feet." Hurricane Andrew killed 44 people in South Florida when it made landfall near Homestead on Aug. 24, 1992. About 285 people defied mandatory evacuation orders in Mexico Beach. Police made two sweeps of the town Wednesday morning and recorded names of everyone who planned to stay, though officials said it is impossible to know who might have left during or immediately after the storm. "We don't have a building -- from my understanding, the water surge moved it off its foundation," Mexico Beach Police Chief Anthony Kelly told ABC News on Friday. "The officers, I finally made accountability of them all today, two days after the fact. ... They're not just my officers, the people that I work with, they're my family." Emily Mitchell returned on Saturday afternoon to what was left of the house her family owned in the city. The roof was ripped off, walls were blown in and she called it a "total loss." They expect to just bulldoze the lot. They are unsure what their next step will be because her parents had decided they couldn't afford to pay for hurricane insurance. "We didn't want to tell anybody about Mexico Beach because it was such a sweet town, we were scared that people would know about it and keep coming," she said. "It's just totally wiped out." Neighboring Panama City was hit just as hard as Mexico Beach. Many survivors told of hunkering down in their homes as they were torn apart by the 150 mph winds. "I decided to stay because my family decided to evacuate, but the pets had to stay here," Panama City resident John Pandullo said. "They didn’t have a place to go. So I wanted to protect them or be there for them in case something like this happened -- and it did." Pandullo rode out the storm in a closet with his dog, Rosie, as the house literally collapsed around him. The roof caved in and the living room and garage of his parents' home no longer exist. "It was just so crazy and it’s just so bad," he said. "The dog was right here and she would not leave my side and she would not move. She was shaking extremely bad. And the winds were coming in and the rain was all pouring down on us and basically, I waited for over an hour. "I managed to make a phone call actually at the peak of the storm, and I was actually able to talk with my parents at the time," Pandullo continued. "And my mom was praying with Jesus on the phone about it the whole time you know -- 'Please let him be alive.'" Five people, including a firefighter, died in Virginia as flooding caused massive damage in an area already hard hit by Hurricane Florence last month. Three people died in North Carolina, all due to falling trees, and a young girl was killed in Georgia when debris was blown through the roof of her grandparents' home. There were still 600,000 customers without power across Florida, Georgia, South Carolina, North Carolina, Alabama, and Virginia as of Sunday morning. ABC News' Rob Marciano, Will Carr, Jeffrey Cook, William Gretsky and Acacia Nunes contributed to this report.